I know it’s pretty obvious this theme of the consequences and enmity raised by rushed ambitions is a major part of this show’s second season, but hot damn does it take a new turn here. The episode does something different once more, and instead of the entire first half being dedicated to Mika taking down the Mobile Armour then second half dealing with the immediate fall out, it is relegated to a flashback from one month ago the story’s time. I remember I said they shouldn’t overdo the time skips for the show, yet here it is again, and RIGHT AFTER I noted my uncertainty on whether the show is taking too long to get to the point. …I do think so though, because outside of the time skip, the show is really taking a risk in its storytelling. This long march by Orga to become “King of Mars” is now tempered by the fact the “Trans-Am-ing” (for lack of a better term) of the Barbatos by Mika once again has caused him to lose further function of his body. He ended the first season with a hazy eye and a limp right hand. Now it’s his entire right side. The heartbreaking conversation Kudelia and Atra have after their conversation with a bedridden Mika brings to light something we will never see in him: the character arc. Sure, his standoffishness with Kudelia during the earlier part of the first season vis-à-vis his respect for her now can be seen as development, but he never really changed there, it was Kudelia who did all the changing herself. In fact, everybody changes around him, or he in his own way gets them to change. He lifts Orga out of his self-pity and uncertainty whenever that person’s in a funk; he is an inspiration to Hush to be like him despite that kid’s sad past, and gives Macky the further insight on how to control Gjallarhorn. It seems my worries over Mika in Season 2 are misguided. If this episode is any indication, I should not expect the big change of character in him, but instead everybody else in his vicinity. THEIR character development is what I should be watching, and take note of. The show I believe even notes that through Atra and Kudelia’s shared epiphany of how Mika losing function of his entire right side didn’t affect his overall demeanour. But the impact is strong enough that, in a moment of vulnerability, a tearful Atra, grabs Kudelia by the arms and BEGS the poor girl to sire Mika’s child. Wow. It was only a season ago where Atra cheerfully ruminated on the idea of both Kudelia and her having Mika’s offspring. Now? That aforementioned scene happens. Why would Atra say such a thing? More importantly why would she give up her chance to bear Mika’s child for Kudelia? 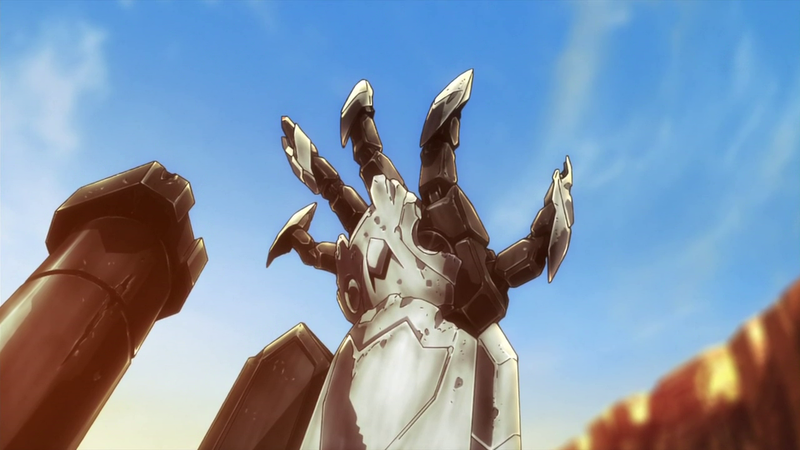 I know she likes (nay… LOVES Kudelia), but seriously… Then there’s that final scene where Orga tries to let Mika down and keep him away from piloting the Barbatos, yet Mika denies him that, and tells him he will continue to do what he’s doing to get to the place Orga wants all of Tekkadan to be. Ultimately it leads to him opining about Kudelia’s world without war, and how continuing such a path will help make it possible even at the cost of his body. What on Earth is he thinking? He continues to be an exceptional subversion of Gundam protagonists with episodes like this. I guess we’ll find out what’s he thinking within a couple of weeks, since this show skips the week of New Year’s. Joy. I like how Ride tricks out the former Ryusei-Go into his own mobile suit. Looking forward to more of him in the near future. Also REALLY curious how Hush is taking this kind of revelation. While it is kinda neat how he’s been essentially Mika’s caretaker for the most part, we don’t really see much of a reaction from him regarding the situation. Is he STILL interested in mobile suit piloting? Who knooooows? Also also interesting how the Mobile Armour, after it was destroyed, is never mentioned again. Who took its remains? What will that mean in the near future? Who knooooooows? Tekkadan is kindof a big deal but why can't they invest in a wheelchair for Mika? I needz the sound effect for the Mobile Armour. So terrifying.